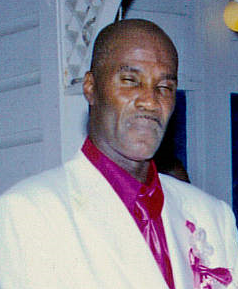 Calverton H. Roberts, also known as “Sonny,” of Stoney Ground died on June 26. He was 60 years old. He was preceded in death by his parents: Denly Constant and Bernice Roberts. He is survived by his sons: Calverton Roberts Jr., Calvin Roberts and Carlton Roberts; sisters: Leonora Warner, Juliet Henry, Donna Roberts, Rona Jhero and Blondelle Roberts; nieces: Anetta Warner, Natasha Harris, Sarita Malcolm, Cassandra Jhero, Natalia Lake, Cassilda Dujon, Sherifa Clarke, Gesil Ramos and Ronisha Roberts; nephews: Deroy Gordon, Tyrone Lake, Oren Gordon, Hector Ramos, Jeffery Joseph, Kelvin Moolenar, Ronald Gordon, Trevor Clarke, Armand Malcolm, Kishawn Petersen, Jamal Lake, Rishawn and Shawn Henry, and Nydrell David; great nieces: too numerous to mention; great nephews: too numerous to mention; aunt, Victoria Merrick; uncle, Foster Roberts; and brother-in-law, Joseph Thomas. He is also survived by special friends: Jodie Lawaetz-Mays, Lee DeLorenzo, the Anally Farms family, Samuel Carr, Jerrilyn Morris, Gloradine Brown, Yvonne Roberts and family, Edwin Christopher, Roslyn James, Hyacinth Parris, Salomon and Joe Lawrencin, Rodrick Lake and family, Karim, Abdeljabar, Jerome Green and family, and Dusha Joseph; cousins and other relatives: Norma Merrick, Joycelyn Kirby, Eunice Merrick, Ionty Merrick, Devon Edwards, Athlyn Merrick, Philmore Merrick, Walterfield Merrick, Uriel Merrick, Flora George, Iotha Russel and Yvonne Roberts; as well as other relatives too numerous to mention. A viewing will take place at 9 a.m. and a funeral service at 10 a.m. on Friday, July 14, at St. Paul’s Episcopal Church, Frederiksted. Interment will follow at Kingshill Cemetery.